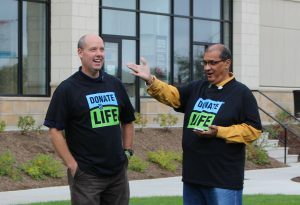 Finger Lakes Donor Recovery Network > News & Views > News Blog > October 6th is Organ Donor Enrollment Day! October 6th is Organ Donor Enrollment Day! Finger Lakes Donor Recovery Network is rallying community members to make October 6th, 2016 the day to take action and join the New York State Donate Life Registry. During last year’s inaugural Organ Donor Enrollment Day, thousands of New Yorkers made the decision to pass life on by registering as organ and tissue donors. Organ Donor Enrollment Day also generated hope…that New Yorkers do care and will take action and that New York can do great things! Join the New York State Donate Life Registry! It only takes a few minutes to fill out and send in the enrollment form. Anyone over age 18 can register, regardless of medical history. Go to www.passlifeon.org and click to enroll! Think you might be registered, but not sure? Fill out the enrollment form, just to be certain. It’s important to document your consent to be an organ and tissue donor, and the best way to do that is by joining the New York State Donate Life Registry. Even if you previously enrolled, information (like your address) will be updated. Already a registered donor? Give yourself a pat on the back! Making your decision to pass life on through organ donation not only could help save lives, but it’s a gift to your family, as well. It relieves them of having to make the decision on your behalf. Go Social on Organ Donor Enrollment Day! On October 6th, proudly share on your social media that you just joined the New York State Donate Life Registry or are already enrolled as an organ donor. Doing so will help spread the word about the importance of making the decision and signing up. With your help, we’ll make Organ Donor Enrollment Day in New York State a huge success and give hope to the nearly 10,000 people currently waiting for a life-saving transplant in New York.